Social Innovation Fund Ireland is proud to announce that they will be sponsoring the next SOUP Dublin event which will take place on Thursday 26th April in Third Space Aungier Street. To register to attend click here. At our recent Social Enterprise Development Fund Roadshows, we asked participants what supports they valued most when testing their innovations. The feedback was unanimous – seed funding to test their idea, and mentoring support to ensure they made the right decisions when starting out. We’re delighted to be partnering with SOUP Dublin to provide a quick response to this valuable feedback. 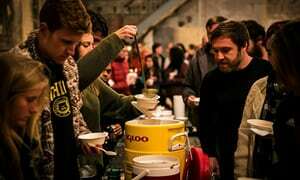 The ‘SOUP’ concept is part of a global, grassroots movement that was started in Detroit in 2010. There are now over 80 SOUP groups around the world that provide a platform for budding social innovators to pitch their early-stage ideas and win start-up cash to get it up and running. It’s a simple concept: Attendees pay €5 (suggested donation) at the door and listen to four people pitch an idea to improve the local community. Pitchers may not talk for more than four minutes, and the audience can then ask a maximum of four questions. Hot soup is served and the audience then votes for the winner. Social Innovation Fund Ireland will match the money that is paid at the door and the winner will take home a cash prize.